"I've always written autobiographically. There's an arc of my life with all the songs in it. 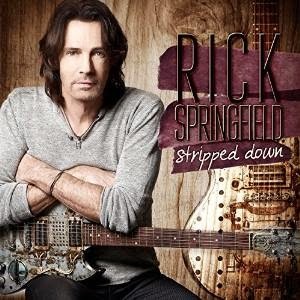 People often ask me if I'm sick of playing 'Jessie's Girl' or 'Don't Talk To Strangers' and I'm not, because they're my life" - Rick Springfield, up close and personal with the intimate live release in 2015. Recorded in 2014 and receiving rave reviews and sold out seats across the states, here's the chance for the rest of you to met the man. Indeed. It's 'Stripped Down', acoustic and electric guitar versions of his biggest hits and then some. These kind of laid-back releases could go either way. The whole "MTV unplugged" thingy surely proved that too much of a good thing is never really that good? Let's face it. We were all sick and tired of the concept after a while. This on the other hand is quite the great surprise. And huge credit to Ricky for being the cool entertainer and not just another stuck up rocker. I've never had to pleasure of catching him live in concert. But he's definitely the proper storyteller on this DVD (and CD) as well as the provider of fun in between banter. Certainly not afraid to tell some jokes on his own expense for that matter. You'll smile along to the melodies and banter such as the desperate cry during "Don't Talk To Strangers" (sadly not included on the DVD merely CD) - 'I can't sing both parts - I need your help'. It's all good, it's all witty, it's all fun. Rick at the centre of the stage and attention, surrounded by the audience and merely with the help of a laptop (which include backup vocals, drums-machine, hand claps, and various other instruments). The voice is pretty much intact and there's absolutely no need to feel worried about the live quality of the man. He's not just another nostalgia act since he's still out there making great new music (Songs for the End of the World). He recently finished filming Ricki and the Flash with co-star Meryl Streep (release in the summer of 2015). Currently working on Season 2 of HBO's critically acclaimed 'True Detective', and of course the notorious role of Dr. Drake on General Hospital. Yeah... but we don't really care about his TV and film stuff? - only the music.